Film Soundtrack, 2005 (Sony) (3 / 5) Although the movie version of this hysterical Broadway smash was generally regarded as an inferior stage-to-screen adaptation, the soundtrack album is highly enjoyable overall. The film may have lacked a cinematic flair in being overly faithful to the stage version, but the score was given a full-blown movie musical treatment, to wondrous effect. The orchestrations by Doug Besterman and Larry Blank are a joy to listen to, as are the expanded choruses, and the zippy musical direction of Patrick S. Brady adds just the right amount of over-the-top frenzy. 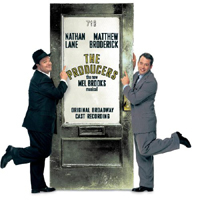 Almost all of the songs from the show score are retained, as well as the brilliant performances of Nathan Lane and Mathew Broderick. Vocally, these two sound even better here than on the original Broadway cast album. A new performance, by John Barrowman as the lead tenor in “Springtime For Hitler,” is at once vocally thrilling and appropriately campy. On the minus side, a major let-down is the absence of Brad Oscar singing “Haben Sie Gehört Das Deutsches Band?”’ The rendition heard here, by the better-known Will Ferrell, lacks enough energy to be funny. And while Uma Thurman may have looked good in the movie as Ulla, her solo “When You’ve Got It, Flaunt It” also misses the punch of the original stage performance by Cady Huffman. But if you skip these tracks, this is a fine and very listenable recording of one of the funniest musicals ever created. — G.A.